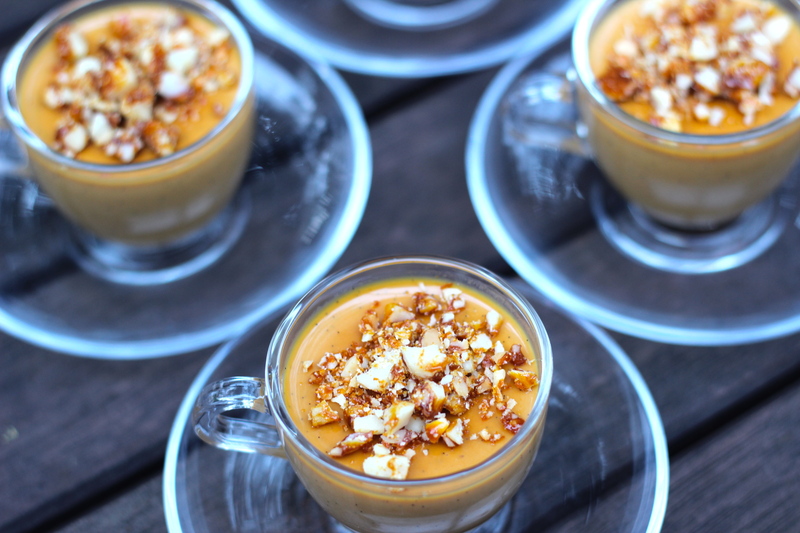 The salt in the caramel cuts through the sweetness and makes this a delicious dessert. I have finished it off with a macadamia praline which is super easy to make! The panna cotta itself only takes about 15 minutes to put together and the praline about 5 minutes 🙂 It just needs to be made in advance because it takes a few hours to set in the fridge. I went out especially to find something to present this dessert in. I found these gorgeous little glass tea cups and saucers and I think they look super cute and are a perfect portion size for dessert :). This recipe made enough to fill 8 of these little tea cups. Enjoy! Place the gelatine leaves submerged in a bowl of cold water and set aside. Put the 1/3 cup sugar, cream, milk, vanilla bean seeds and the whole vanilla bean in a medium saucepan over medium heat and heat until bubble begin to appear around the edges and the sugar has dissolved. Set aside. Place the 1/2 cup caster sugar in another medium saucepan and place over medium heat. Melt the sugar until it all dissolves and becomes a dark amber colour. Do not stir this mixture. You can swirl the pan to mix it in if needed. Slowly pour the warm cream mixture into the caramel, whisking constantly. Be careful as the mixture will bubbles and rise. Add the salt and mix. Squeeze the excess water from the gelatine leaves and whisk into the hot caramel mixture until dissolved. Strain the mixture into a pouring jug and divide between mini glasses/ramekins. Refrigerate for at least 4 hours to set. For the praline, prepare a baking tray lined with baking paper. Place the caster sugar in a small saucepan and place over medium heat. Melt the sugar until it all dissolves and becomes a dark amber colour. Do not stir this mixture. You can swirl the pan to mix it in if needed. Add the chopped macadamias and mix until combined. Spread the mixture onto the tray lined with baking paper into a thin layer and allow to set hard. Then chop into small shards to garnish the panna cotta when ready. Thanks Gaby 🙂 they taste pretty delicious too. You should make them!